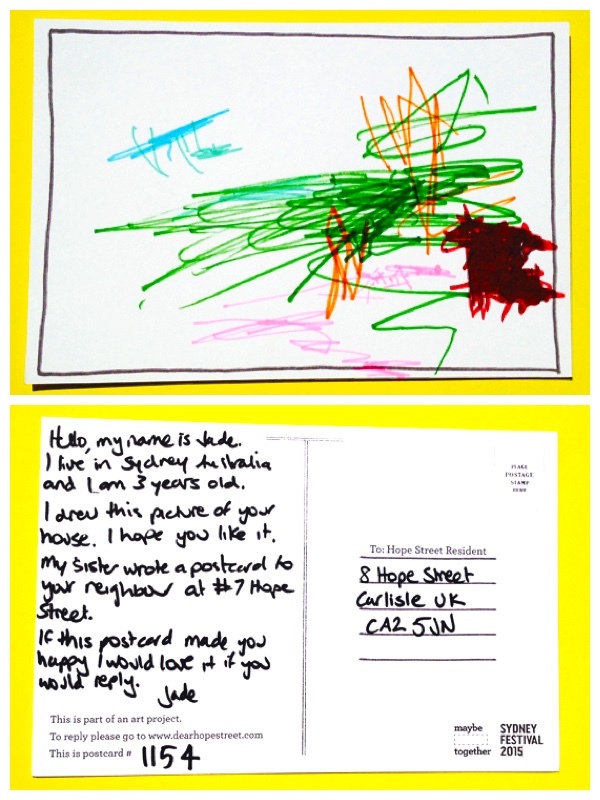 Hello Jade , I’m writing to you tonight because I found your lovely postcard when I went to visit 8 Hope Street, in Carlisle , which as I am sure you know is a long, long way from Australia in England . I do not live at the house in Hope Street , I work for an Estate Agent who is selling the property, at the moment no one lives in the house, but as I was sorting through all the letters I found your postcard and couldn’t ignore it, I love your drawing it is very colourful. I have a daughter who lives in Australia , she is called Natalie and lives in Perth . Well that’s all for now . Bye from a very wet, and cold Carlisle .